This season there has been far too much talk about what is wrong with the AFL. Let’s celebrate what’s right by running through the best moments of the season. To cover myself, I crowdsourced the opinions of footy Twitter on this very important topic. The suggestions came flooding in. Jack Higgins GOTY. Suns winning at the SCG. The Rnd 8 Showdown. Ben Ronke 7 against the Hawks. Dees in the finals. Varcoe’s goal in the qualifying final. The very young (and very prospective) Dogs were a significant underdog coming into the Round 15 Friday night game against the Cats. Harry Taylor had a kick after the siren to win Geelong the game. He was confronted with a wall of blue as he jogged in to take his kick. It sailed wide, and the Dogs celebrated like they’d won the premiership. The Cats’ loss turned out to be a significant one: a win here would’ve put Geelong into fifth spot on the ladder at the end of the home and away season, with a likely home (as in Kardinia Park) final against the GWS Giants. For everyone else, the entire Dogs’ team manning the mark, then bursting into rapturous celebration, was one of the best moments of the season. It was the debut of the new Perth Stadium, and didn’t the Sydney Swans’ superstar know it. 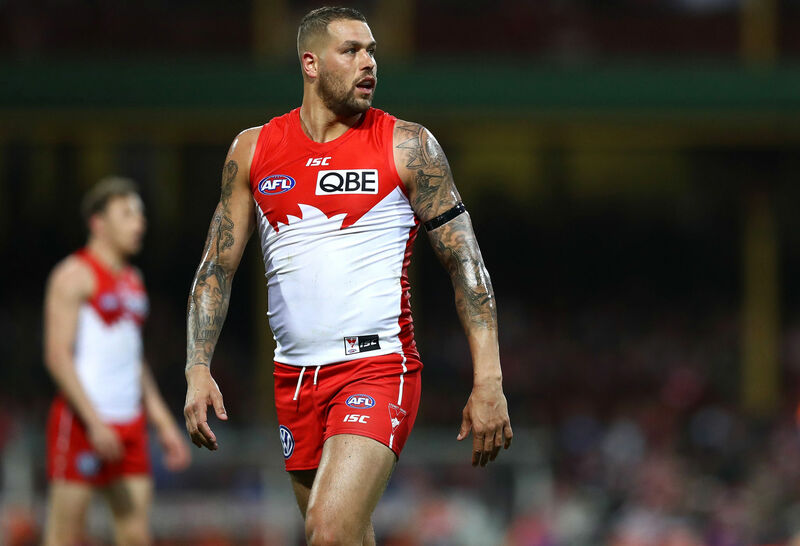 Lance Franklin put on a show, kicking eight goals in a dominant display, including two from outside 50 (on the wrong side for him) and two from acute angles just inside the stripe. Buddy was at the peak of his powers, and it was arguably the only time we saw the best of him in 2018 given he carried a bruised heel from the game through the rest of the season. West Coast’s pride was also bruised, but they managed to recover. It was a glorious execution of a delusion of football grandeur by Jack Higgins, who has already become one of the most fun players to watch in the league just 20-odd games into his career. The Sydney defender’s return from a near-six-year hiatus, owing to a surely unprecedented six ACL tears, was an uplifting moment for the whole league. It was a triumph of persistence, determination and patience. That the Swans got the win, in a close game decided in the last minute, was a nice touch. Johnson himself took 11 marks and had 15 disposals patrolling the half back line, and looked like he’d settle back into a Sydney team looking to find its way into the top four. Alas, it wasn’t to be. The Cats were a pre-season premiership favourite, while the Hawks were expected to improve upon their 12th placed finish from 2017. A fast-paced, high scoring game from the get-go, the Hawks worked their way into a 97-79 lead at three quarter time. A see-sawing final term saw 15 scoring shots, the Cats drawing level at the 26-minute mark at 117-117. The final stages were frantic and high pressured. Ultimately Hawthorn got over the Cats by a point, resulting in them starting the year 2-0 and never really looking back. It was only Round 2, but Easter Monday gave us one of the more compelling contests of the 2018 season, between two clubs with high expectations. It isn’t all bad news for the Cats in my 2018 top ten. Zach Tuohy’s game-winning kick for goal after the siren against Melbourne in Round 18 was enormous, as was the final quarter leading up to it. Tom Hawkins kicked four goals as the Cats chased down a 29 point lead the Dees had built through manic defence and penetrating ball movement on the narrow Kardinia Park surface. Hawkins was enormous, taking mark after mark and running the Melbourne defence off its feet. It was part of the Geelong forward’s second half purple patch, when it looked as though he might pinch an All Australian spot from guys who had done more of their stellar work early in the year. Tuohy’s mark was contested, and his shot heaped with pressure. You wouldn’t have known it, though Tuohy himself admitted he was worried the shot would hang left when it left his boot. The goal was one of three close games from seven attempts the Cats won, with two of them coming against the Dees at opposite ends of the season. Ultimately it proved crucial to the shape of the eight, as the Cats’ loss to the Dogs did before it. Two weeks later, over three days in August, the AFL lost its mind. Five straight games were decided by single digit margins, a VFL/AFL record, with each of them compelling in their own way. It was too much for a thinking fan to process. It started with Richmond holding on against Geelong on Friday night. The Cats looked languid, and trailed by 23 points in a low scoring affair at the 20 minute mark of the final quarter. Geelong proceeded to slam on the last 20 points of the game to fall just short. 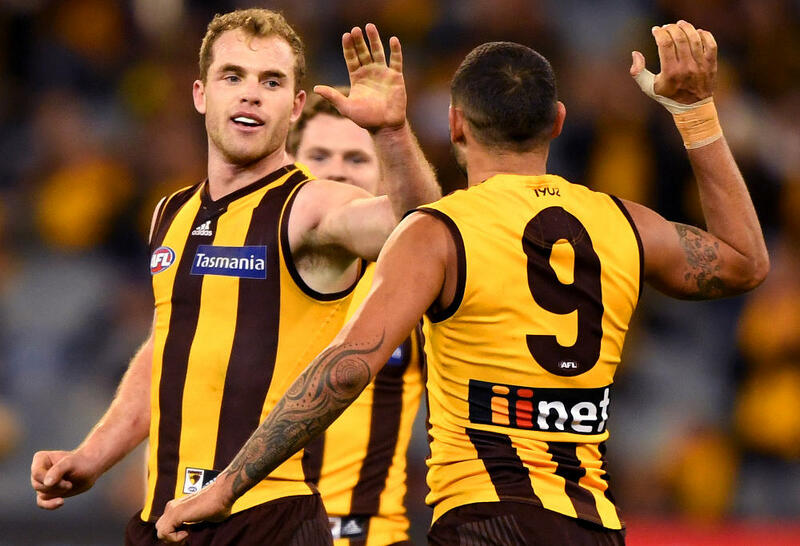 The Hawks and Bombers reprised the situation on Saturday afternoon at the MCG, though the game margin was much tighter throughout the day. Hawthorn kicked away a little in the last, but were kicking behinds instead of goals. With ten minutes remaining Essendon booted 2.1 in five minutes to get the margin back inside a goal, and it took a James Worpel shot over the back to make it a bit more comfortable for the Hawks. Essendon would take the last shot of the game, but it wasn’t enough and the Bombers fell a little short. Further north, Cam Rayner had an opportunity as the game clock ran down to put the Lions over the top of North Melbourne. But the rookie rushed his kick – playing on and taking a shot around the corner instead of a set shot – and missed. The ‘Roos had been in front from the start of the second quarter, the Lions catching them with a frenetic burst of open football from the middle of the last quarter. We then moved on to the second Showdown of the year, which was won by the Crows in controversial circumstances. Josh Jenkins kicked a goal with around five minutes remaining, and it appeared on replay that he thought it had hit the post. A score review was inconclusive and so the umpire’s call stood. Jenkins himself was interviewed after the game and said he thought it hit the post. Indeed. The last game was Alex Johnson’s return, which was relatively low scoring and didn’t really soar to any higher plane from a skills perspective, but delivered an exciting finish. Tom McCartin’s soccer at the bottom of a pack gave Sydney the victory. The rest of the round was… not so good. The Dogs beat St Kilda in a ho-hum contest, before the GWS Giants eviscerated Carlton (with 16 men on the field at times) by 105 points, Melbourne smashed Gold Coast by 96, and West Coast accounted for Fremantle by close to ten goals. We’ll always have those first five games. As far as electric performances go, Ben Ronke’s third game against Hawthorn on a Friday night in Round 8 is the most impressive of the lot. Ronke kicked four goals in the first quarter, and had his fifth just six minutes into the second. It came out of nowhere, just like Ronke himself, who was taken with pick 17 in the 2016 rookie draft. Hawthorn’s back line had no answers to Ronke, who was taking marks, winning ground balls, and keeping himself in dangerous spots all evening. He ended the night with seven goals straight on ten disposals, including kicking the match-sealer in the last quarter. 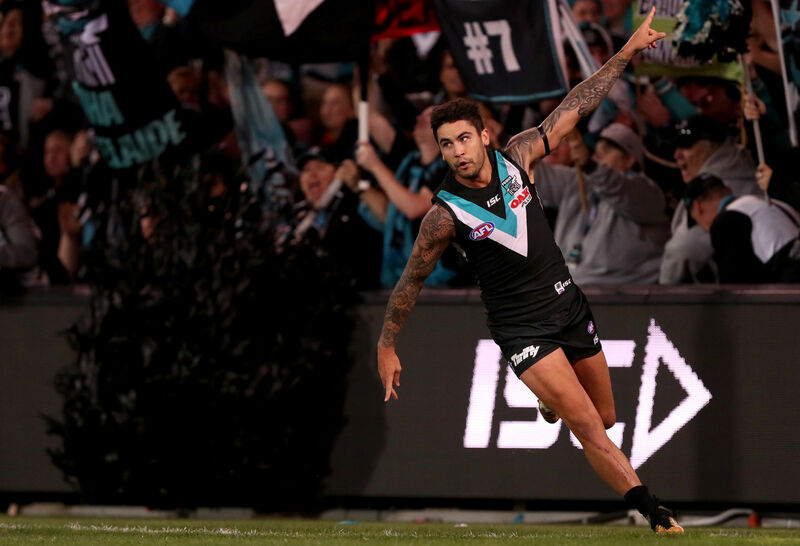 The last three minutes of the Round 8 Showdown provided us with the most compelling football of 2018. I summarised it all in a stream of tweets earlier in the year. And here’s the last two or so minutes in full flight. It wasn’t just the last few minutes that made this game so incredible. Adelaide raced to a three goal lead in the first, and extended that a shade in the second. The Power had some of Bugs Bunny’s secret stuff at half time, kicking 7.5 in the third quarter to take a two goal lead at the last change. The team traded goals in the last, before Adelaide’s three goal burst from the 25 minute mark. And then Steven Motlop won the game. Incredible stuff. Call me biased by West Coast’s premiership has to be the best moment of the 2018. 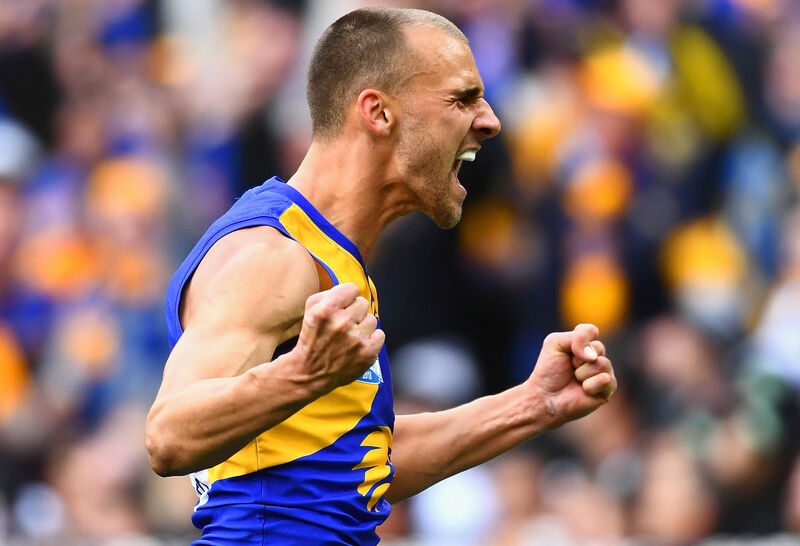 Written off in the preseason, the Eagles soared to heights almost no one expected, and became our fourth different premier (and eighth different grand finalist) in four years. The game was won with a decisive play with less than two minutes remaining. Jeremy McGovern intercepted a kick from Adam Treloar, disposing to Nathan Vardy on the right back wing. Vardy wheeled around and found Liam Ryan who took a pretty stunning contested mark under the circumstances. Ryan gathered the ball, calmly moved it on to Dom Sheed in the right forward pocket, and the rest is history. Those are my top ten moments for the 2018 AFL season. How about yours? AFL players are bred tough to become the best of the best, just as Invisi-gard is bred tough to keep you safe at home. Find out more here.